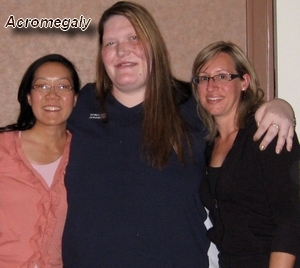 Acromegaly is a chronic debilitating disease with an insidious onset, resulting from the effects of either hypersecretion of growth hormone (GH) or increased amounts of an insulin-like growth factor I (IGF-I). Once recognized, acromegaly is treatable in most patients, but because of its slow progression of symptoms and signs, its diagnosis is often delayed for 15 or 20 years. Untreated, acromegaly can result in serious complications and premature death. It is, therefore, important to recognize the early symptoms of acromegaly and to understand its cause in order to facilitate early diagnosis and treatment. 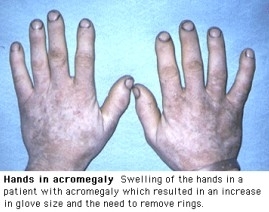 The name acromegaly is derived from the Greek words for “extremities” and “enlargement” and reflects one of its most common clinical features, the abnormal growth of the extremities and body organs. The onset of the disease is so gradual that neither the patients nor their families notice it. Enlargement of the hands and feet is often an early symptom, with patients noticing changes in ring or shoe sizes. Gradually, facial features become enlarged, especially the frontal bone and mandible. Head size increases because of growth in both soft tissue and skull mass. Ribs thicken, creating “barrel” chests. Overgrowth of bone and cartilage often leads to crippling joint pain from accelerated osteoarthrosis, and as the disease progresses, generalized muscular weakness becomes a serious feature. In addition, other symptoms that may occur are headaches and visual disturbances that could lead to blindness. There may be enlargement of body organs such as the liver, spleen, kidneys and heart. Cause is usually a pituitary adenoma, affecting the anterior lobe. 1. First screening test: measure serum IGF-I level. a. Direct measurement of the GH level is not as useful, because it is secreted in a pulsatile fashion and a random level may be falsely normal. b. Upper limits of a normal IGF-I level, depending on the assay: >380 ng/ml or 2.5 U/ml. 2. Failure to suppress serum GH to less than 2 ng/ml after 100 g oral glucose is considered conclusive. a. Patients may show suppression of GH or a paradoxical response. b. Patients will not suppress GH to 2 ng/ml or less (the normal response). c. GHRH level >300 ng/ml is indicative of an ectopic source of GH. • Pegvisomant is a growth hormone receptor antagonist that has shown promising results in the treatment of acromegaly. Combination of bromocriptine and octreotide may be synergistic, allowing a lower combination dosage than alone. • Patients receiving radiotherapy need long-term follow-up to monitor the potential development of hypopituitarism. • Continuation of medical therapy should be based on the normalization of IGF-I levels.